Super excited to be chatting with the talented Ashini Shah behind www.zeezeezoo.com, the site to buy cool, funky, socially responsible children products that celebrate our south asian roots. A onesie that says “Papa kehtay hain bada naam kare ga“, a shirt for your “dramaybaaz” three-year-old and a luggage tag that tells the world “Musafir hon yaron“, this site has it all to help you express yourself with a unique southasian/bollywood flair. Contest details at the bottom to win a $50 (USD) giftcard to shop on the site with free shipping anywhere in the world. Plus a special promo code for UrduMom readers! So grab your chai and join us as I chat with Ashini. Me: So tell us, how did your journey start? Ashini: I grew up in the US, have lived in London for the past six years, and make frequent trips to India. When I became a mother, I realized that I wanted my daughter to grow up celebrating Holi and Halloween, and everything in between that had been a part of my upbringing. The Zeezeezoo concept was created to cater to the South Asian diaspora worldwide – new parents like me who have a connection to their culture and want to keep their South Asian heritage alive! Me: Why the name Zeezeezoo? Ashini: Zeezeezoo (and various versions of these syllables) is the buzzy song of a black-throat green warbler. Interesting because this is a migratory bird. And like migratory birds, we as humans travel in search of better, bigger, more interesting opportunities all the time. Whether to another city or another land, we chase our dreams. My dad has done it, my husband has done it, so many of my friends have done it. And when I think about it, I have done it. And this was a name that just clicked. The whole idea was born to serve these dreamers who find themselves away from their home, or once-home. Me: What does the design process for the products look like? Ashini: The ideas pop up at the most random of times such as driving my daughter to nursery, listening to a Bollywood song, taking a shower or making dinner. It’s things I’ve seen or heard growing up, that can be taken in isolation to be quite fun and cheeky. Also, I have had some great input from family. The ‘consult my legal team’ concept came from a cousin who lives with her in-laws and finds that her daughter always has her grandparents support (I am sure many of you know the feeling!). My mother-in-law, who is a huge Bollywood buff, suggested the ‘Dadi Amma Dadi Amma‘ design! A few ideas have also come from trying to make funny western concepts that we’ve come across a little south asian – such as Future Cricket Star, or Khaana Sona Rona Repeat. There are many companies that do funny one-liners on tees, but the novelty comes by giving it that desi twist. We’ve got great positive feedback from various customers so far who say that it’s great to have something that connects to their roots. From here, we have a group of freelance South Asian illustrators we work with to bring the concept to life. Every design is hand-drawn to give the products a warm, cute, happy feeling. 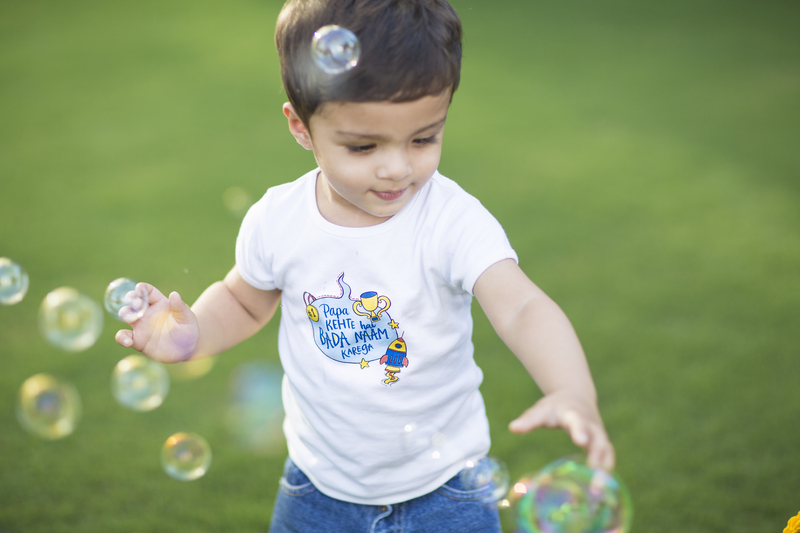 Me: What are some of the interesting things you have heard when your children wear Zeezeezoo? Ashini: The great thing is that the designs bring an instant reaction. People immediately connect with the concept and have a huge smile on their face, whether an ‘awww’ or an ‘omg i remember that song’, and then of course, they ask what other designs we do, etc. Me: Can these products be customized? Ashini: We are working to make this possible for all the products – at the moment we offer it for a single product, but can do so on special request. The easiest thing to do is to drop us an email with a request. Me: How far and wide are your clients spread on the globe? Will you ship anywhere in the world? Ashini: This is honestly one of the most wonderful parts of the business. It is amazing to know that we have customers in so many parts of the world: South Asia (of course! ), the US, the UK, Canada, the Middle East, Africa, the Far East, Australia. Me: What do you think is the importance of multicultural fashion in the world of today? Ashini: Well this is it, I think. The whole reason for our being. People use fashion as a means of self expression. Gone are the days of needing to ‘fit in’. People are proud of their roots, and find it important to keep it alive: in their fashion, in their homes, in their speech and in their food. Checkout the website zeezeezoo.com for amazing, fun and filmy products for your children, nephew/niece, grandchildren or maybe yourself! These products make great memorable gifts. Use the promo code URDUMOM to get 15% off your order! This is valid till December 31, 2016 so move fast! Win a $50 USD gift card to shop on Zeezeezoo.com (plus free shipping to anywhere in the world!). Winner will be announced Dec 26, 2016! Contest closes Dec 24, 2016. Each of the actions below, gets you one entry in the random draw! Increase your chances by doing them all! Tag your friends on the facebook post. You get an entry for each friend you tag! Visit urdumom’s instagram account @urdumom for ways to enter the contest there! Let me know if you have any questions about the contest rules or how to enter!